The Shaggy Long Legs (ケダマグモ?, lit. : "Hairy Orb Spider") is a miniboss in Pikmin 3, and is assumed to be a member of the arachnorb family. This Arachnorb has masses of long, shaggy hair covering several parts of its body. Its color scheme depends on the habitat that it dwells in. This species of Arachnorb does not stop to rest as do the rest of the members of its family. However, it does stop to shake off Pikmin, which are able to climb the Shaggy Long Legs' legs. There are two variants of this creature found in the game: a black and purple variant found in the Tropical Wilds, and a black and white variant found in the Distant Tundra. A different creature called the Baldy Long Legs is essentially the counterpart of this enemy, appropriately named due to its lack of hair. However, that one only resembles the Tropical Wilds variant of the Shaggy Long Legs. ↑ The game files specify this value to be 100. “The Shaggy Long Legs is a very large creature that crushes any Pikmin unfortunate enough to get caught under its large feet. To defeat this creature, your Pikmin must first pluck all of the Shaggy Long Legs' hair. When you encounter a Shaggy Long Legs, throw several Pikmin onto each of the creature's limbs. As your Pikmin climb the creature, they'll rips out any hair they find. Once your Pikmin pluck the hair from each of the Shaggy Long Legs' joints, they'll move onto the longer hair covering the creature's body. The Shaggy Long Legs frequently shakes its attackers loose, so it's important to gather your Pikmin as they fall to the ground. When all of the creature's hair is gone, use your Pikmin to attack its exposed body. The Shaggy Long Legs will receive minimal damage on the areas of its body covered in hair. To remove the hair, the player must direct Pikmin to climb the towering beast's legs when they are on the ground. It is recommended that the player uses many Pikmin, as each step the creature takes will shake off some of the Pikmin on that leg. Once they reach the first joint, they will begin to pluck the hair. Once it is stripped of all its hair, the creature will violently roar and shake off its attackers. Quickly call the Pikmin back and have them climb up the leg again so they can attack the second joint and remove its hair. Once a leg has had both joints removed of their hair, the Pikmin will climb directly to the body and begin stripping off small strands of the longer hairs. As the Shaggy Long Legs loses hair, it will take damage. In total, it has eight joints covered in hair, and it will lose about half of its health once all hair is removed. Once all of the joints have had their hair removed, direct your Pikmin to climb up the creature's bare legs and attack its main body. It will begin to lose hair and once all of its hair has fallen off, the creature will begin to visible shake in pain and will speed up its stomping. Using Winged Pikmin after all its hair is gone is also a viable strategy since they'll automatically charge at its main body without the need to climb the legs. It is also important to note that the Shaggy Long Legs will periodically move between two different neighboring areas of the map. To prevent wasting time, it is recommended to have two different leaders waiting in both locations it shows up in, so you will be able to always attack it, regardless of where it retreats to. Another tactic is to do something else while waiting for it to return back to the area. The idle leader will eventually announce their panic when confronted with the returning enemy, which should alert you to resume the fight. The best Pikmin suited for the battle are Rock and Winged Pikmin. Rock Pikmin are immune to crushing, and can still climb up the Arachnorb's legs, making them good choices to take out the hair with. A medium-sized group is best so that all Pikmin do not get shaken off. Once all hair is removed, Winged Pikmin can simply fly up to the abdomen of the creature, allowing for a quick fight. Ultra-spicy spray makes ending the battle even quicker with this strategy. To note however is that Rock Pikmin that climb up the legs will only hit the exposed core once before falling off by themselves. See also: Beady Long Legs#Naming. Something that is "shaggy" has a lot of long hair. Its Japanese name is the same as the Beady Long Legs's, but starting with ケ? (lit. : "hair"), making it ケダマグモ? (lit. : "Hairy Orb Spider"). This creature shares its internal name with the internal name of the Beady Long Legs in the past games, damagumo. The arctic variation of the Shaggy Long Legs. The arctic Shaggy Long Legs. A hairless arctic Shaggy Long Legs. Another screenshot of a hairless artic Shaggy Long Legs. The tropical Shaggy Long Legs. Analysis of the tropical Shaggy Long Legs. The tropical Shaggy Long Legs falling from the sky. The inside of the Shaggy Long Legs. The resemblance to the Baldy Long Legs is apparent in this image. It has the same body except with green joints instead of black. The data file on the Shaggy Long Legs. The Shaggy Long Legs is one of the few exceptions in which Rock Pikmin can latch onto things. The Shaggy Long Legs' animation changes depending on its body condition. While it has hair, it will stomp faster than without it. But if it has lost all hair on one of its legs, that leg will move slightly slower and shakes in pain. By utilizing a sequence break in the cave where the player discovers the Yellow Pikmin, it is possible to fight the Shaggy Long Legs with unlimited time. If one kills the Tropical Wilds Shaggy Long Legs while two feet are on the arena border and the other two feet are on the actual arena, the legs attached to the feet in the arena will bend backwards. The Shaggy Long Legs is the only miniboss in Pikmin 3 that doesn't appear in Mission Mode. 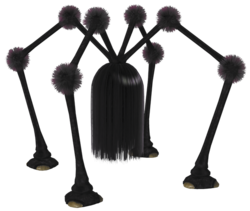 The Shaggy Long Legs is one of the only enemies in the Pikmin series to have multiple variants with the same name. The only other enemy is the Adult Centipare. This page was last edited on March 15, 2019, at 17:11.